One of the famous ski resorts, named Laax, was conceived as a small hamlet in another Swiss valley. But fate decreed otherwise. To date, Laax, along with the neighbouring villages of Flims and Falera, forms one large resort area, which was called the "Alpine Arena". Laax is an amazingly picturesque corner of the pristine alpine nature with crystal clear air, soft snow and amazing mountain landscape. Three of the resorts (Flims-Laaz-Falera) just a few years ago caused only puzzled looks even of the experts of the ski resorts. 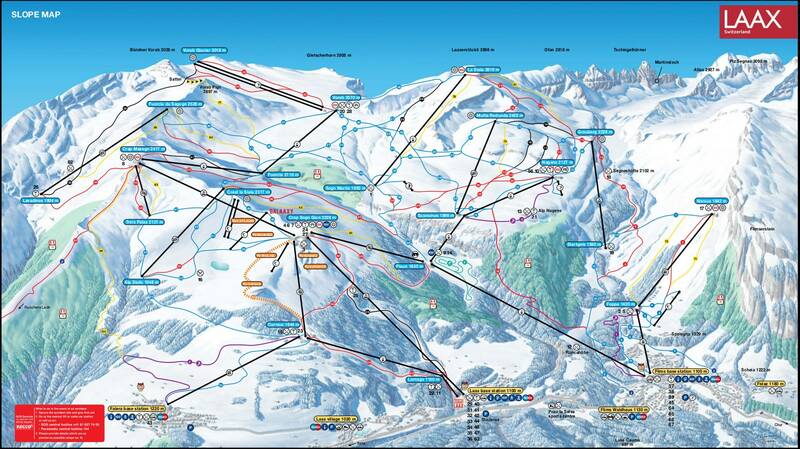 Extremely popular in Switzerland, the ski area was little known in other countries. Although 224 km of various trails, located at altitudes from 1100 to 3018 m, a glacier and a few different villages for accommodation - a significant reason to come to these places. An effective system of lifts, magnificent landscapes, excellent snow parks ... as often happens in Switzerland, inhabitants of this country leave the best for themselves and do not rush to advertise. This region is especially appreciated by snowboarders and freeriders for the abundance of snow and modern lifts. In addition, in all the villages of the region you can easily find inexpensive accommodation options. For those, who prefer to spend their holidays relaxing with comfort, there also a lot of opportunities of recreation in Laax. The time of transfer to Laax from these points is approximate, it depends on traffic conditions and current weather also. In Alps2Alps each our client will be provided with the most affordable rate for shuttle services on any destination and at any time. Even if you are going to visit Laax in the peak of the season, we still guarantee the lowest price for all our services. Notice that Alps2Alps never overstates prices for our customers, opposite we consider all possible factors in order to lower our standard rates, whenever it could be done. We always recommend our customers to make transfer booking in advance for getting best discounts. Travelling in off-peak season and mid-week days typically leads to the biggest savings. Alps2Alps offer a very significant discount during these periods of time (up to 60% in total). Your quote will also be dependent on the availability of the vehicle, the transfer schedule, car utilization, road tolls and parking fees at the airport. If you have any other requests, please contact us directly to discuss that. «Alpine Arena» is the largest ski area in Switzerland with a guaranteed snow cover and conditions for practicing almost all winter sports. All its resorts (including Laax) are located on a sheltered mountain sun terrace. Vertical drop is huge, and most of the slopes are of medium complexity, with long descents through beautiful mountain landscapes. All the slopes of the "Alpine Arena" are available for skiing. Both beginners and experienced skiers can find here the tracks to their taste. A feature of the Alpine arena is the focus on active sports recreation: the largest number of equipped trails in one ski area, one of the highest throughputs of a modern, well-planned system of lifts. In Laax there are a lot of entertainments for every taste. At the service of the travelers is an indoor skating rink in the sports center and open on the lake in Laax at the Park Hotel Waldhaus. There are also public wellness SPA complex, tennis courts, routes for walking and hiking in the mountains, a total length of 250km, climbing. In the ski schools of Laax there are special programs for kids. In one word, the resort offers its guests a lot of possibilities for family recreation and amazing holidays with children. You will not get bored here! If you want to provide yourself with the best possible start of your winter holidays, don’t delay the moment of your transfer booking. Choose Alps2Alps and travel with us in comfort, and at the same time paying the most beneficial price for your shuttle. We recommend you to order a shuttle right now to avoid the increase of price that might be in future. Just call us or fill out the online request form and wait tranquilly for your ski holiday.